How to use a client management system to captivate clients, drive repeat business, get regular referrals, and develop brand evangelists. What if new customers came to you, rather than you hunting for them and prospects begged to work with you at a premium price point? What if you were the only choice in the eyes of your ideal clients and not just another choice? Securing all the clients you need isn’t a dream, it’s a reality that isn’t as hard as you might think, and a client management system is the secret to making it happen. Most freelancers, business owners, and entrepreneurs invest heavily in project management to streamline workflow and increase profitability. They spend hours researching, testing, and selecting just the right project management software, they invest time and energy into setting up technical automations to save time creating development environments, and they even set up systems to reduce workload. A project management system manages the planning, organization, and implementation of a project with a defined outcome. Project management is almost all about improving the project experience and reducing stress for the service provider not the client. A client management system on the other hand, manages the education, support, and care of the client to help them reach a defined outcome. Client management is all about improving the project experience and reducing stress for the client. When a client is educated, supported, and cared for throughout the entire project, they will ask fewer questions, require less hand-holding, and cause almost zero delays. As a result, the service provider will spend fewer hours on administrative tasks, less time reassuring the client, and experience created focus. Provides extraordinary service and an unparalleled experience to captivate clients and turn them into raving fans, powerful referral sources, and trusted brand evangelists. Provides more flexibility, less stress, fewer interruptions, better margins, and higher profits to support service providers in producing the highest-quality work and the best results. Client Captivation is all about making sure you exceed your clients’ expectations and your clients feel happy and grateful for the relationship with you and the work you’re providing. That way you easily earn repeat business and loads of referrals. But that’s a lot of pressure, a lot of work, and it takes a lot of time, unless you have a client management system in place to manage the entire captivation process for you. 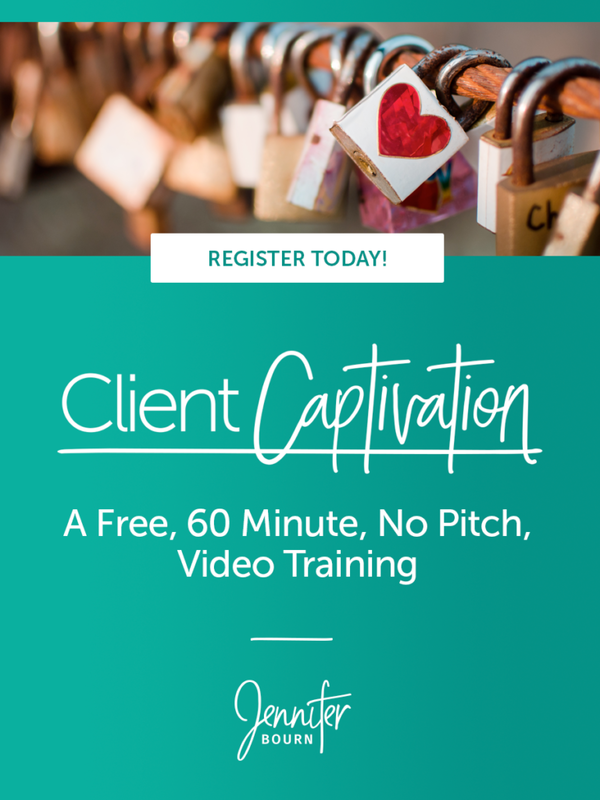 If you’re interested in learning more about how to better manage your clients, I invite you to check out my Client Captivation video training.